The riots were not disaffected young people trying to get a job. It was a riot of young delinquents jealous of people who have made something of themselves and finally realising they do not have the get up and go attitude to do this. There is nothing else behind the riots except jealousy, and Marxists can protest this all they like, but this time their flawed doctrine cannot justify what happened nearly a fortnight ago. So the obvious question is where do we go from here? It is all well and good with the constant media analysis but what is needed firstly is stronger Police power. There needs to be a certain instance where the Police should be able to use all the force necessary. Those people criticising the use of force would clearly rather just see the Police get hit and attacked whilst they do nothing. The attitude of rights for the criminal needs to stop… and fast. As soon as you go to jail or infringe on the rights of others, then your rights should all go, it should be an eye for an eye. The common denominator is the flaws in a democratic system. Unfortunately the emergence of the human rights law and our membership of the EU has meant that any time anyone faces justified condemnation they claim human rights abuses. It has proved democracy does not work. It was Winston Churchill, arguably the greatest Prime Minister ever, who proclaimed that ‘democracy is the worst form of government’ and it is. You can even argue that democracy and the flawed principles behind it helped the Police in refraining from using force against the rioters – the fear that you’re damned if you do and damned if you don’t. I have always believed that the Police need to instil fear into any members of the country who misbehave. Indeed, martial law should have been declared on the second consecutive day of rioting and the army placed on the streets, that has always been my view of solving anti-social behaviour – create a domestic army division who patrol streets in city areas so that the population feel safe that they are protected and that the scum on the streets think twice. This is what the riots should bring about, a greater focus on how to deal with law and order, and the need to put to bed any liberal protests about the way treatment of the rioters is being undertaken. The cause of the riots is an underclass, that problem of being the lowest of the low in society. These people are uncivilised and uneducated and no matter what people say there are opportunities there for them. How hard is it to work hard at school, how hard is it not to play truant from school, how hard is it to stay inside of an evening and spend weekends off the streets? Everything is there for them. You hear of disadvantaged people who have left school with few qualifications and made something of themselves. This is admirable and achievable. Instead there is a culture of jealousy, and a lot of it is provoked by Marxist and Union doctrines which pour scorn over anyone who has had any success or comes, through no fault of their own, from a privileged background. This is what I call the ‘doctrine of jealousy and hypocrisy’. It is indoctrinated into people and I have seen it firsthand. University lecturers address people by the Russian Communist greeting of ‘comrade’, there are Student protest at any right wing policy and an inherent trend of lies being told by the left when things don’t go their way and I firmly believe that this was a key factor in the riots and protests we have seen in the past year or so – simple bare faced jealousy. What it has also brought about is stronger and more stringent control over the right to protest. Even banning protesting altogether should not be shied away from. Yet again though that old ‘criticism of police tactics’ rather than the criminal damage caused will be the media focus, and as we all know from recent events, the media will do literally anything to get a good story. Protests are fine as long as they do good and are not politically motivated. Its amazing going through university campuses and seeing the words ‘Tory scum’ on banners, showing that in fact protests are politically motivated and the common cause again is jealousy and the means by which young people have been indoctrinated to believe that all rich people or people who have worked hard to have a satisfying career are in some way the enemy, and it is this which is the real political issue here – and nothing else! My name is Robert Bayliss and I am a History graduate from the University of Brimingham. I have sympathies with the policies of the Conservative Party. I think unions are the biggest trouble makers in the political arena and in it for their own ends, Marxism is a venomous doctrine that teaches people to hate people who work hard and I believe we should leave the EU, scrap the human rights act and in prison life should mean life. I love football and am an Aston villa season ticket holder. « Pop will analyse itself (in a hundred years time)? I agree with you and really enjoyed reading this article. You are right many people that do not owe anything make themselves. 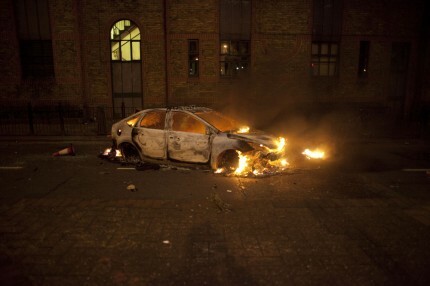 And then people like the riots think they can destroy everything rather then trying to take another path. They are lazy and trying to get attention by being rebellious. I have no understanding for such behavior and do not think that any of them should get away with it. A couple of issues with this article- Churchill proclaimed democracy the worst form of government apart from all the others which have been tried- he wasn’t actually condemning democracy. Secondly, the idea of banning politically motivated protest is absurd and unthinkable in a free country- the complex issue of deciding what makes a protest political (the anti-Iraq war and G20 protests would certainly be difficult to classify) is compounded by the sheer hypocrisy of the idea- how can we criticise oppressive regimes if we essentially reduce democracy to simply putting a cross in a box every 5 years? Finally, I truly do not believe that simple jealousy was behind these riots, as some of the rioters came from well-off families and had decent life prospects. Instead we must ask what the flaws are with our current strand of capitalism, which has seen the wealth of the super rich increase astronomically whilst not improving life for not only the lowest earners in society, but also the increasingly squeezed middle classes.